Hot Pilates — Hot Pilates is an exer­cise sys­tem used to strengthen mus­cles, increase flex­i­bil­ity and improve over­all health. Hot Pilates uses Pilates Prin­ci­ples, HIIT (High Inten­sity Inter­val Train­ing), and Tabata Train­ing. Exer­cises are per­formed on a mat. 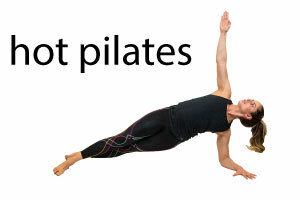 The Hot Pilates sys­tem includes exer­cises for every part of the body and appli­ca­tions for every kind of activity. Heated Yoga / Stretch — Recover and relax for one hour with long stretches to help alle­vi­ate stiff­ness and sore­ness. The class will help you open up the hips, stretch out the ham­strings, and loosen up the lower back. This will take place in a hot room.